The No. 9 Nebraska volleyball team dropped a 3-1 (29-27, 19-25, 25-27, 22-25) match to No. 6 Illinois on Saturday night in front of a crowd of 8,343 at the Bob Devaney Sports Center. 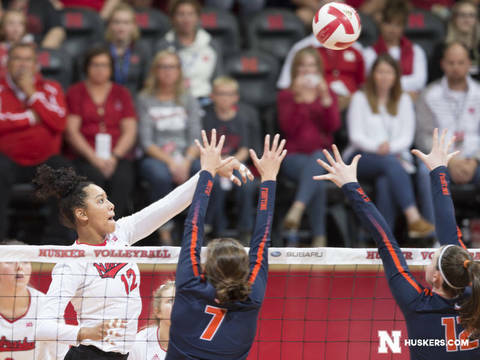 The Huskers had an edge in aces with eight to Illinois’ five. Hames had four aces, a career high. Sun had two. But Illinois had 61 kills compared to the Huskers’ 50, and the Big Red committed six more attacking errors. Nebraska celebrated the “Weekend of Champions” at intermission, recognizing the 1998 and 2008 Big 12 champion and NCAA semifinalist teams. Set 1: Hames opened the match with an ace, and the Huskers claimed a 5-3 lead after an ace by Maloney. Stivrins smashed an overpass to increase the lead to 7-4, but the Illini came back and tied the set at 7-7. A block by Hames and Stivrins sparked a 5-1 Husker run that put them up 12-8. Stivrins and Sun had kills, and Sun combined with Schwarzenbach for a block during that stretch. Illinois wouldn’t go away though, scoring three straight to tie the score at 14-14. After a string of sideouts, Nebraska got a kill by Schwarzenbach and an Illinois hitting error to go up 21-19. But a Husker hitting error and a kill by Quade had the set knotted once again, this time at 21-21. Illinois then went ahead 22-21 after a block by Bastianelli and Poulter, but Foecke and Schwarzenbach came right back with a block of their own, and the Huskers won a long rally after an Illini hitting error to go up 23-22. Stivrins won a joust at the net to earn set point for the Huskers, but Illinois got a kill from Quade and an ace from Poulter to tie the score at 24-24. Stivrins terminated three times and Schwarzenbach also had a kill to give NU four more set point chances before a block by Schwarzenbach and Sweet finally ended it at 29-27.